Standardbreds are consistently showing their versatility, whether it’s riding or driving, for show or for pleasure. 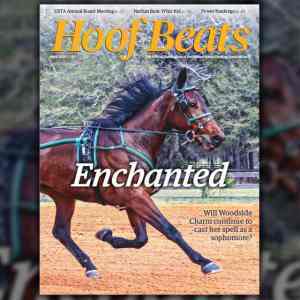 Hoof Beats is happy to share stories from readers about their favorite Standardbreds. This month, Charlotte Gelston writes again about Notorius Bluestone, now named “Blue” and under the care of Terry and Charlie Dickinson. For the first two adventures with Blue, see the December 2017 and January 2018 issues. 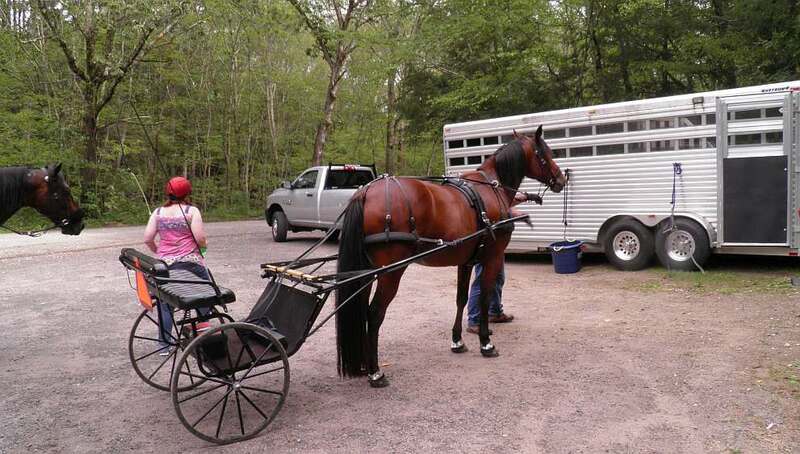 In preparation for Blue’s debut with the local driving club, Terry, Charlie, and I trailered him and Rhythm to a nearby state park for our first public outing. We regularly drove along the local roads and through the old woods roads, but we never encountered any other horses in harness. We hoped to meet some other driving horses there. Loading the horses took some extra effort. The only time Blue had been in our trailer was a year ago, when we brought him home from Linda’s farm in New Jersey. The stock trailer had been set up with a box stall for him, rather than the removable center divider that we use when hauling two carts and two horses. Although he was accustomed to a ramp, he was quite willing to step up into our spacious, light, and airy trailer to set out on his new adventure. Terry had promised him lots of grass in Connecticut! When he unloaded, he was able to turn completely around and exit moving forward. Bribery did not work. Coaxing did not work. I even put his hoof up onto the floor of the trailer to show him how easy it was to step up. He simply stood there, one hoof in, one hoof out. We never put pressure on them to load. It always backfires on you. We waited patiently. We waited longer. Finally he decided to climb in, ate the handful of grass that Terry had been using to entice him, and we were off. On the day before the club drive, we decided to do another practice loading and quick trip around the block, hoping to lessen the time it took to accomplish it the first time. Rhythm decided he was not going to load first this time. Perhaps he didn’t like waiting in the trailer for so long? Rearing and swerving off to the side, he made it clear that he wanted Blue to go first. We asked Blue to “step up,” and after looking, sniffing and giving it some thought, he surprised us and walked in to munch the grass Terry had waiting for him. Rhythm hopped in next to him without any fuss. On the day of the club drive, the “boys” loaded in less than five minutes, and we had a wonderful time. Excited by our success, Blue’s perfect behavior, and the nice weather, we planned to go out again the next day. Accordingly, we left the two carts in the trailer, as it necessitates moving the divider over to the side to unload them. Blue walked right up to the trailer, confidently climbed in, and Rhythm followed suit. We were thrilled! Off to the state park we drove, unloaded the horses, moved the divider, unloaded the two carts, harnessed and hitched both horses and began our drive. ADVENTURE AWAITS: From left, Rhythm, Terry Dickinson, Blue and Charlie Dickinson get ready to embark on a drive. Photo courtesy of the author. The plan was to drive the entire route, old woods roads and groomed dirt roads, about six miles. We had travelled less than 300 yards when we had to climb a short, fairly steep incline next to the barrier rails formed by old telephone poles. There was sufficient room between the pole on the ground and the large rosebushes off to the right for us to pass through as we had before. However, Murphy’s law came into play. Just after Blue gave a big pull to get his cart and two passengers up the incline, Terry and Charlie heard a loud crack. Blue stopped short. Rhythm, who was right behind him, swerved to the left to avoid bumping into him. This quick movement put the left wheel up and over the telephone pole, which catapulted me out of the cart on the right side! 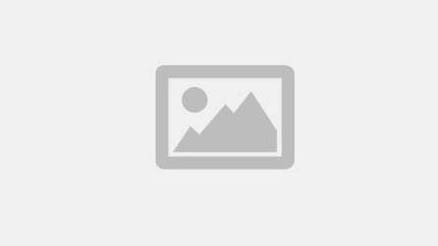 I landed face down in the grass, with the reins still in my hands. Seeing me on the ground, Rhythm also stopped short. I believe that driving him open saved me from getting dragged. If he had been wearing blinds, he would not have seen what had happened and might have just kept on moving. OOPS! 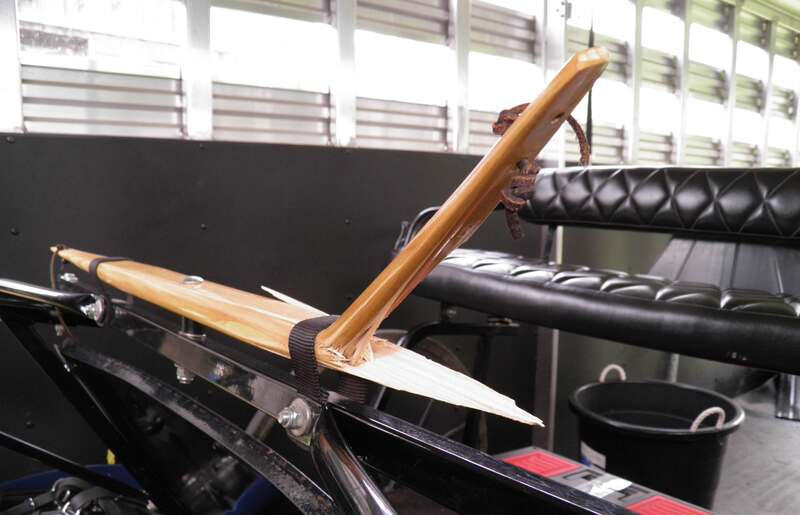 On a steep incline during a scenic drive, the Dickinsons’ cart ended up with a broken whiffletree, or singletree, after their horse, Blue, gave a big pull to keep the cart and its two passengers moving forward. Photo courtesy of the author. We humans were quite confused, but our two intelligent, confident Standardbreds just stood there waiting for us to sort things out. I could imagine how much worse it would have been if he had reacted by bolting away. Charlie calmly went to Blue’s head to hold him, while Terry started to unhitch. I held the buckle end of my driving reins in my left hand, told Rhythm to “eat” (my cue to give him permission to graze in harness) and with my right hand helped Terry unhitch Blue. Rhythm munched happily; Blue stood still; and with us working on both sides at the same time, we had Blue free of the cart in a minute. Neither he nor Rhythm gave us any trouble or seemed spooked by the double mishap. The unflappable disposition of the Standardbreds is priceless in situations like this. Terry pulled the light G&S Trail cart; Charlie led Blue; and I drove Rhythm back to where the truck and trailer were parked. We all agreed that we were very happy it had happened only 300 yards from the parking area, not miles down the woods roads by the river, entailing an uphill climb to get back. It was the shortest drive we have ever done, but a memorable one.